It is difficult to ignore money and how much influence it has in our lives. 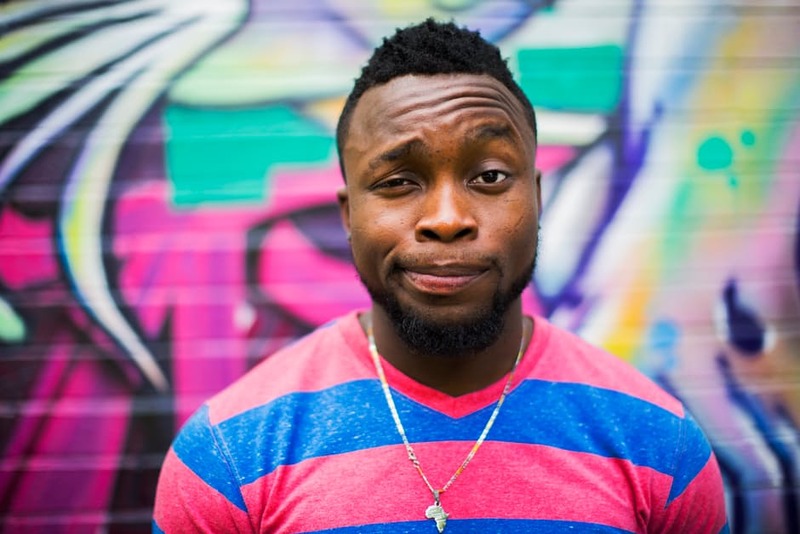 People like to bang out the cliché “Money does not buy you happiness”, and by now many of you have heard of a reply to that. From a very metaphysical and spiritual sense it does not, however, it increases opportunities to do more, giving you a sense of freedom, choice and control. 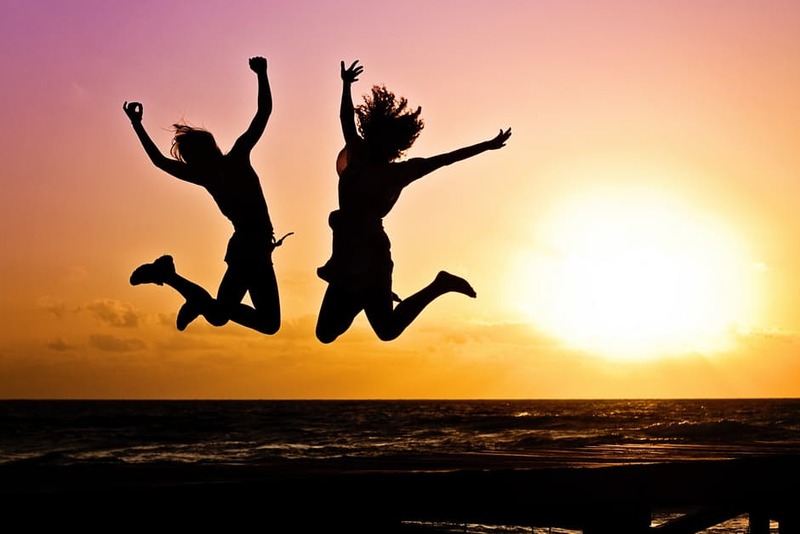 You could argue the relief of being able to do more allows one to feel more at ease, thereby increasing their wellbeing and positivity, and their outlook on life. It also gives you the opportunity to do more socially provided you have the people to spend the time with, and that you manage the activities within each 24 hours well. Let’s not lie, money is important and I don’t think anyone should shy away from wanting a lot of it. What they do with it is up to them. With this in mind some of you would argue that money is the root of all evil and that it changes people, I would rather say, of course it changes people, and if it does some have not managed to adopt the right mental resilience and fortitude, pertaining to weak emotional intelligence. This can only be improved by conditioning the mind and training it in such a way that allows one to be ready for life’s financial challenges. If you are reading this article I am sure that about 80% of you have at least heard of the book Rich Dad Poor Dad – by Robert Kiyosaki, and at least 50% of that 80% has made some attempt to read the book. For me that book had clarified some concepts that I already knew deep down, however, it surfaced them to my life in a way that had never been done before. After reading this book you think to yourself “Now what…” or “I need to start investing” (usually in property). 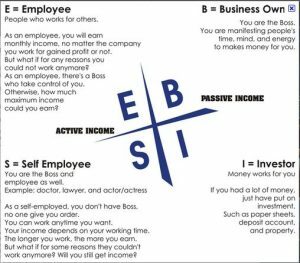 Although Mr. Kiyosaki invested into property, working his way through the “B” quadrant to eventually be in the “I” quadrant as a capitalist, he does not say anywhere in the book “You must do property to get out of the rat race”, it was just the way he made his millions. I’m not going to explain what the different quadrants mean, the image above does this pretty well. I will explain how you can progressively and interactively learn how to change your thinking, if you want to eventually be a “B” or an “I”. For those of you who have already read Rich Dad Poor Dad or at least understand the concepts of it, I would urge you to read his proceeding book Rich Dad’s Cashflow Quadrant. I say this because it talks in much more detail about the mindset of an “E”, “S”, “B”, and “I” which is required to allow you to eventually make that shift to the side you want to be in (or stay in). I took the concepts in this book pretty seriously, so seriously in fact that I invested energy, money and time into building a property portfolio. This was a huge mistake! Not from the point of view of the education I was receiving, if anything it was world-class. Moreso because I was thinking about just making money as opposed to whether it was the right avenue for me. With no regrets it has allowed me to find the path I am on now which is effectively digital marketing and coaching, as well as made my entrepreneurial network much bigger! If you do want to get into property investing and you know that this is the entrepreneurial road for you, here is the course I did! You will not find anything like them in the country and pretty much all other property courses in the UK are replicas of these people. I say this because a lot of them running the courses were a student on this course. 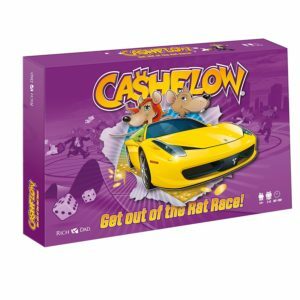 Now Cashflow is a game that aims to stimulate your thinking towards how you can get out of the rat race, what is the rat race, well it is working hard for your money by trading your time for it; it is not having proper control over your biggest asset, time and surviving on just enough each month; it is the 9-5 or 8-7 we commit to ourselves daily following the 50-50-50 plan i.e. work 50 hours a week, for 50 years, for 50% of our paycheck to be cut once we’ve made it! The people who do not understand this game will disrespect it and say “Oh, so it’s like Monopoly…?” The answer is HELL NO! It is not like Monopoly it is more like… erm… YOUR LIFE. Let me explain how the game works. Please note that this is the older version of the game (practically the same) which is what I am used to playing. The newer version does not use cash, however, uses a financial ledger to record income and expenses. You can play by yourself, however, it is most fun and educational with 3 – 6 players. You are given a coloured Rat which is placed on the inner part of the board i.e. on the wheel where it says “Start Here”. There are cards in the game that have professions on them like a doctor, truck driver or janitor. Players must choose one at random in order to start the game. Based on the colour of their rat they are also given a coloured cheese piece which they place on their desired dream they want to achieve. Dreams are on the outer part of the board highlighted in pink. 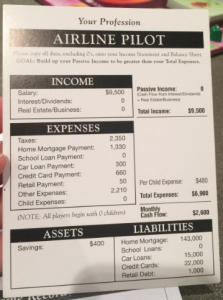 Players must then fill in their Income statement i.e. 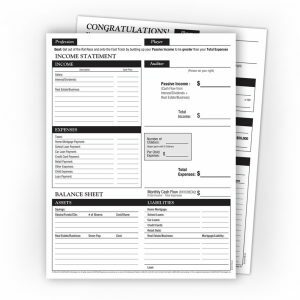 copy the information they have on their profession card onto their balance sheet. Once they have done this, their Auditors (players to their right) must check they have filled in the information on the sheet properly. A banker must be chosen to distribute the money and decide the financial conditions throughout the game. For example the rates for loans etc. In the instructions, loans are set to 10% of the loan taken out and is indefinite until the loan is paid back. The cashflow stated on their Income Statement (note: this cashflow will be handed to you by the banker everytime you pass or land on the yellow part of the wheel that says “Payday”). The money they have in Savings at the beginning of the game highlighted on the bottom right of the profession card. To start the game players must roll a die and whoever gets the highest number starts, then it continues left from that person thereon afterwards. YOUR PASSIVE INCOME MUST EXCEED YOUR EXPENSES!! Small Deals: These cards are compiled of deals that require a down payment of less than $6,000. These deals are usually some sort of trading deal like a stock or a fund, in addition to property deals. Be sure to read the information on the card properly, and understand what the numbers are telling you. I.e. an ROI above 50% is usually a good deal, a negative cashflow is bad! However, it should be in context with your goals in the game as the profession you are. 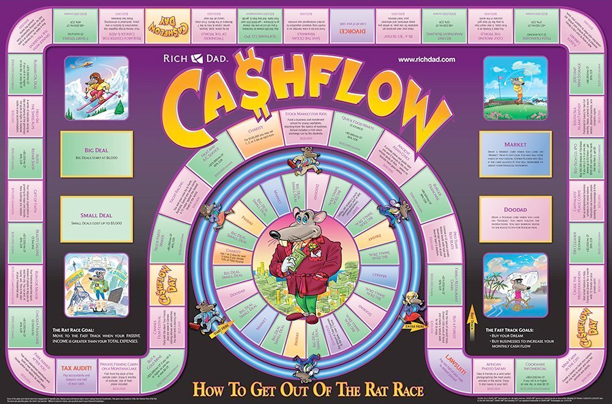 Cashflow is usually $0 – $250. 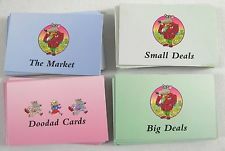 Doodads: These cards are annoying payments you have to make like buying fake jewels or paying for a boat worth $17,000. This will test your emotional resilience and intelligence. Just accept it as part of the game (…and life). Market cards: These cards have conditions that can make you more cash (not cashflow) or lose cash, depending on what assets you have obtained in your portfolio. There are other parts to the inner board such as having up to 3 babies (which is an expense per baby), downsizing (which is paying all your expenses and losing two turns), and giving to charity (paying the bank 10% of your income to roll up to 2 dice on your next 3 turns). Below I will talk about strategies to get out the rat race…. Remember anyone can get out of the rat race so if you are a lawyer, pilot, or doctor, as opposed to a secretary or janitor do not get excited because you have more expenses to overcome via assets. If you understand the numbers and what your aiming for, getting out the rat race should not be a problem at all! You must turnover your income statement and complete this section. Whatever passive income you have made from the first part of the game you must now multiply by 100x to the nearest $1,000. In this part of the game you must roll 2 die, unless you give money to charity where you have the option of rolling 1, 2 or 3 die whenever you want. If you land on someone else’s dream (signified by where their cheese is, on their chosen dream on the board), then you have increased the cost of that dream for them by 100%. Deals usually give you a cashflow of $3,000+ and cost around $100,000+. The strategy is simple for this part of the game; buy up everything as quickly as possible. You are making so much money that it doesn’t matter how careful you need to be. Don’t get me wrong if you can’t afford something (which is rare), or you have a tax audit or get a divorce, you’ll make your money back pretty quickly. Those things only have a short effect on your finances as it doesn’t impact your cashflow, rather it impacts your cash. The more you buy, the closer you are to your goal, and the greater chance you have of winning the game. I would advise that you buy this game and play it weekly or monthly with 2- 5 other friends or family members in order for you to develop the right sort of thinking as to how you can all get out the rat race and eat more bread! I was encouraged to do this via the Rich Dad Poor Dad international coaches, and I can say it has really reshifted the way I approach money. I would also say play the mobile app version, although it is not as flexible as the board game, you can learn from your mistakes extremely quickly, and apply what you have learnt when playing with other people. I have developed a free course in the form of a video series to enable us to first develop the correct mindset and then use this to choose a path that will allow you to better decide how you want to improve your passive income. CLICK here NOW to enrol and start thinking and acting differently about how you can live the life that you deserve. I hope this article has given you value and that you apply these principles in your life as best as you can! If you would like coaching from me check out this link for more informaiton.